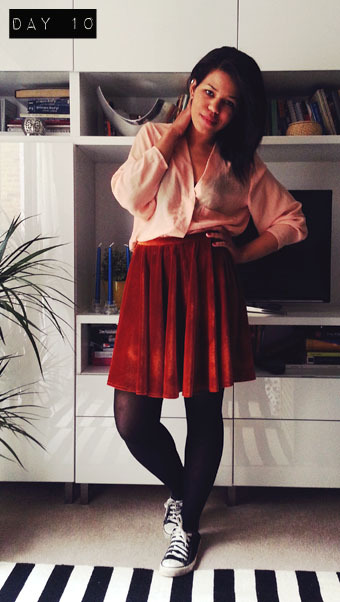 Day 10: Velvet circle skirt (self drafted) worn last week too. ← Me-Made-May 2014: I’m in!!! I love your MMMay outfits! You style is really modern and cool! 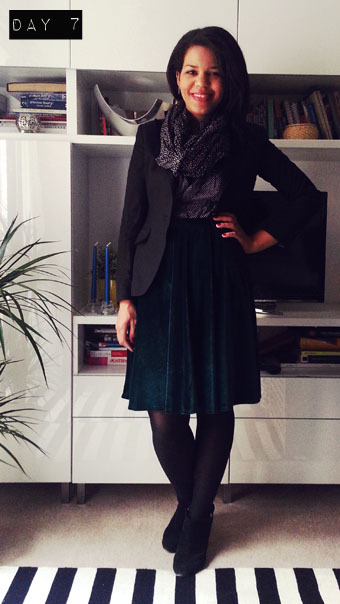 I love the leather skirt with the blazer and scalf! I know what you mean about taking photos. I live in such a small messy apartment, I find it so hard to get good photos! Thank you!! Our flat is small too, and the main reason I find myself tidying up is usually because I want to sew (it makes an even bigger mess, as we all know 😉 ) or I want to take photos. 🙂 You seem to have enough me-mades to go for at least another two months! How do you find doing it so far? You live in a flat? wow. Your decor is lovely! MMMay has been fun! I don’t have so me-made items left… I had to get rid of quite a few of my handmade dresses and most of my makes are summer clothing, so it sometimes makes it challenging to layer them and still make them look nice. It has been lots of fun though! I’m sure I will be taking part next year too! How bout you? Yes, thank you, it’s pretty small, but my sister worked her magic on it! Isn’t the weather getting summery where you live (where do you live by the way? 🙂 ) I’m enjoying MMMay as well and I’m sure I’ll have enough me mades next year to not feel like I’m actually having to do anything special for a month.